With seating for 5 and outstanding rugged performance, the JK Jeep Wrangler Unlimited (4-door) is a capable vehicle on and off road. It gives owners plenty to smile about but throws up some challenges when considering storage. In order to make the most of the JK’s cargo area and maximize storage and flexibility of use, a new roller drawer module has been developed. The RDRF790 incorporates a single Roller Drawer and an integrated Roller Floor top. The design allows for plenty of accessible and secure storage in the drawer. While the roller drawer function is self-explanatory, the roller floor provides easy access to a Fridge Freezer or other gear. The 37 quart ARB Fridge Freezer (10800352) can be mounted in the traditional front to back orientation. Although a tight fit, a 50 quart ARB Fridge Freezer (10800472) can be oriented left to right across the drawer and rolled rearwards for easier access. quality, maximum functionality and ease of use. The RDRF790 incorporates mechanisms on both the roller drawer and the roller floor that lock them in the open position, preventing unintentional closing when the vehicle is on uneven ground. The mechanisms engage at full opening of the roller drawer or roller floor and are disengaged automatically when closing. 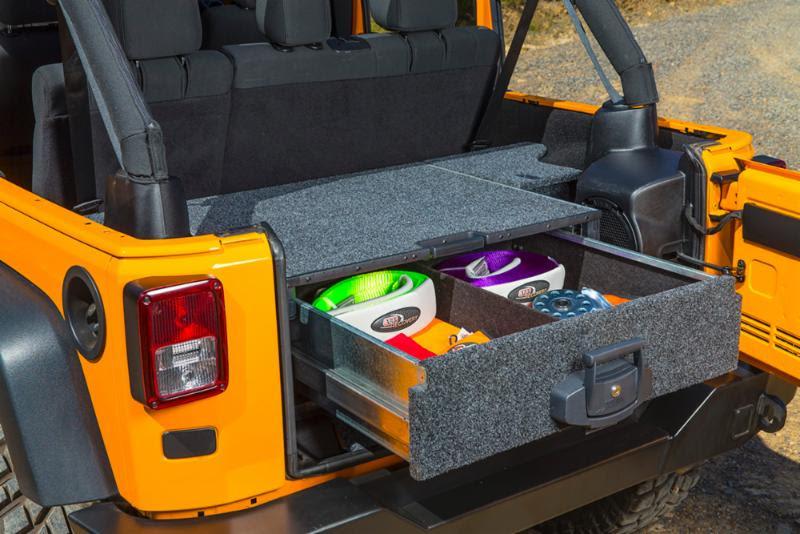 The side floor kit is a recommended optional fitment with the RDRF790 drawer module and fills in the area between the outer edge of the drawer and the sides of the vehicle’s interior trim. The side floor kit completes the floor and provides a larger flat top surface while maintaining access to the wheel arch storage areas. Each side floor kit contains both left and right hand side floors. JK side floors include stainless steel locking tabs to locate and retain the removable floor. Removal is via a simple latch located at the rear edge of the floor. The combination of stainless steel tabs and a simple, straightforward latch yields an easy to use and secure storage area. For models with plastic trim and a sub woofer, space is maintained around the sub woofer to maximize sound output. Access is retained to the factory 12-volt power connection on models with this OE feature. Two side floors are available, one to suit the vehicles with only a carpet rear trim and another for vehicles with plastic rear trim, with or without sub woofer. The install kit provides an attractive removable carpeted cover panel over the jack and tool storage well. Removal is via two thumbscrews.